But before I get to that, I wanted to let you know this guy is the real deal. I’ve had numerous hitting conversations with him in underground (and above ground) parking garages, libraries, conferences, and over dinner. He’s an ex-Big Leaguer who knows what he’s talking about. And that means a lot coming from me because I listen to current and past Big Leaguers talk hitting with a VERY skeptical ear as most of you do. Oftentimes, what gets lost in translation with Big Leaguers is what’s real and what’s feel. Matt tows this line very well. He understands the difference. The reason I’m sharing his information with you is because he has quite a different approach than me, but yet it’s very similar when we have our talks. His system is very complimentary to mine. The Matt Forgatch Nokes student case study. I’m a 10 year MLB Veteran, Silver Slugger Award Winner, MLB American League All Star Catcher, and I have the most successful hitting advisory program in baseball. I’m sure you’ve had some good coaches that you’ve really liked over the years! Yet year after year the pitching gets better, and it’s easy to get caught over thinking, with your timing getting all messed up more often than not. I remember when I was I senior in high school and I told my dad I wanted to quit baseball all together… I was going through a tough time and there wasn’t anyone around me who I felt understood what I was going through, and could get me back on track. I don’t know about you? But it’s easy to fall into a trap of over processing, looking for an adjustment that’ll give you that “In The Zone Feel Again”…the feel you have hitting soft toss from 12 feet, and yet in the game you’re looking at it from 60 feet…that’s what I call a cross your fingers approach. In life, if you want to accomplish great things, you seek out someone who’s the best in the world at what they do! (Hall of Fame) Frank Robinson gave me the MLB plan and 2 years later I was in the big leagues at 21 years old! No I wasn’t just a freak hitter, before I got perspective from Frank Robinson, I was having trouble even making contact. Are you ready to put that kind of frustration behind you? Do you look at other players around the league or on your team for that matter, and you know you have equal ability, but you’re not producing or getting the recognition from the recruiters and scouts that you’ve set your sights on? The frustration is exhausting and affects your home life, your social life, your school work, every part of your life and on top of that, you feel like crap as person if you’re not hitting! Whatever your biggest challenges are, I’ve seen them, and I know how to help you overcome them. I know you gotta be sick of the roller coaster ride of emotions, the pain and uncertainty about your future. Inside this FREE Master Class Webinar (Sorry, this webinar is no longer offered)…There are 5 Simple Shifts you need to make to put all the talent you know you have inside you, and get it working for you again, and not against you. It’s time for the scouts and recruiters to start pursuing you, but you gotta make a shift where you’re not hitting like you’re defending yourself with your back up against a wall, but instead you’re ready like a SNIPER, ready and you never miss your pitch when it’s in your zone. Learning the 12 Touchstones, Simple Natural Hitting Moves that deal with the plan, your timing, mechanics and solves 99 out of 100 problems that will ever come up. Tyler Moore, a kid I coached in the minor leagues with the Nationals, was all but buried with nearly 300 AB’s in July with 6 weeks left and only hitting .195, a hand full of home runs and 20 something RBI’s. It’s very difficult for a player to dig himself out of a hole like that after so much of the season has passed. But like most hitters, I was sure he’d been burned by coaching in the past and felt like he was better off making adjustments on his own. So we finally sat down and talked…I said, “what’s there left to lose at this point, you’re hitting .195, let’s get something positive out the rest of this season and see what happens in the last 6 weeks. Now with Tyler I was dealing with a young professional player, very in tune with the way his body feels when he moves, he can feel what his body is doing, and because of his advanced awareness of his body, we ripped through the 12 touchstones in less than an hour. THAT VERY NIGHT HE HIT 4 SCREAMING LINE DRIVES shot out of a cannon like the pitcher was throwing front soft toss to him. That Season – We WON the Carolina League Championship. Tyler won player of the week 4 out of the last 6 weeks of the season, and was named Carolina League Player of the Year! Inside this Master Class Training Webinar (Sorry, webinar is no longer available)…There are 5 Simple Shifts you need to make to put all the talent you know to get it working for you and not against you. You’ll learn 3 things you can do to make you irresistibly attractive to RECRUITERS, even if you don’t get a hit while they’re WATCHING YOU! Matt Forgatch came to me from a small D3 College (Denison University) and was playing football and baseball. He was very athletic but did NOT know how to use his tools and translate it into the powerful hitter he would become. I took him through the 5 Shifts and he transformed immediately. His first season back from training, he hit .444 and led the league in 12 of 15 offensive categories. Matt, made the decision that baseball was important enough to fully commit to this process! He knew he wanted a program that was organized so he didn’t have to think about his workouts day to day…he just had to follow the workout each day before he went to the ball park and it took 5-10 minutes a day to do his rehearsals and focus work…it’s simply what successful people do. Today the modules are on your phone or computer and even easier to work with. He liked and respected the coaches, so he obviously wanted to be cool and not disrespect them in any way so he was discrete about what he was doing. It wasn’t very far into the season when he was dominating the league in hitting, that he revealed to his coaches that he’d been working with me on the side in a way that didn’t interfere with the team program. The last thing you want to do is be the guy who’s the “know it all” and bucks the team system and workouts, doing odd drills and things that stand out in an almost distracting way. Be a good soldier and follow your coaches drills and workouts, because he’s put his own time and energy into it his program and you owe it to him to follow his lead, if for no other reasons than he’s in authority and you can always learn everyone. Because you’re going through my program, it’s an at home Tai Chi type program where you learn all the natural mechanical and timing moves, along with the plan that came from Frank Robinson himself (hall of fame). If I could go back in time, yet retain all my memories in tact so I had all the skills of the big leaguer I was, how hard would it be to get along with a coach who see’s you’re a talented hitter, with all the high level moves and YOU DON’T MISS YOUR PITCH! He’s going to love you, especially if you respect him and thank him for the feedback he gives you every day. You guys would just relate on a different level than the other players because he’d have more respect for your abilities…you’d have a more collaborative relationship with him…But he’s your coach and having your name written in the lineup card every day, partly depends on how you relate to your coaches, no matter how good you play. So he learned how to apply the 5 Shifts to his Mindset quickly each day, by following simple videos in the modules every week. You learn 6X Rules for the INSIDE PITCH (The moves you rehearse on deck to make sure you’re never get sucked into a MYTH idea every again). The system is designed so you don’t have to think…you just REHEARSE! Everything becomes automated and you become a hitter with natural timing and natural mechanics…AND THOSE AMAZING RESULTS ARE YOUR NEW NORMAL! Mostly for those coaches and parents managing High School and College level players. 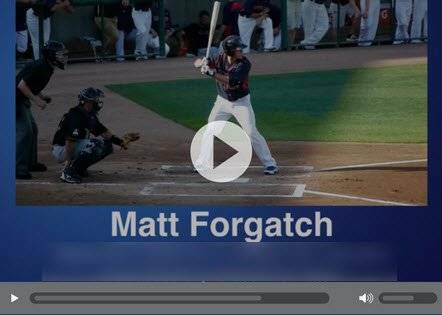 Will younger hitters get something out of Matt’s information? Yes. But the information in the webinar is geared more towards those hitters getting ready for college or pro ball. Is Matt Nokes’s information good for fast-pitch softball? YES!!! It’s outstanding information for ALL humans. Coach Tre’, I’m sending you an email and copying Matt and his wife Susie who handles the technical stuff. He didn’t say what the 12 touchstones were, is there a place online I can find them?